Bearded Dragon Brumation: Do Bearded Bragons Hibernate? Brumation is a reptile version of hibernation, or “winter sleep”. It occurs within the same time period – fall and winter, but it is different from hibernation in the sense that reptiles do not shut down their metabolism completely – they just slow it down. Bearded dragons experience brumation too, and not just in the wild. Beardies entering autumn slumber is something that is commonly seen in a terrarium setting. However, each bearded dragon will brumate differently and maintain different levels of activity. While brumating, your beardie will fall into a sleep-like state that will last for months. During that time, he might not eat or drink a lot – or not at all. Naturally, that gets many owners worried. Still, always remember that brumation is a natural process which should not be stopped, but helped. Otherwise, bearded dragon ready to brumate should seem healthy – with clean and elastic skin, clear eyes, no gaping mouth or other signs of infection. If your beardie is trying to brumate out of season (in the summer), or he is under a year old – it is highly likely that his health is compromised and that his behavior only mimics brumation. Poor UVB lighting, improper temperature, vitamin and mineral insufficiency, vitamin overdose (especially with D3) or infections can be a cause of the brumation-like behavior. It is not something that you should tolerate – the underlying causes should be addressed as soon as possible. What if a Few Months Old Beardie is Still Trying to Brumate? According to some opinions, beardies that are under a year old can still enter brumation. In nature, beardies certainly cannot avoid brumation just because they are “too young” for it by our standards. The main concern about beardies that are younger than a year old is that still don’t have the full adult body mass. Therefore, if something happens to be wrong (e.g. parasites) and they enter brumation, they will waste away much quicker than an adult. To be on the safe side, take your beardie for a vet checkup prior to late Autumn, just to check if he is parasite-free and in good general condition. What to Do Before the Bearded Dragon Brumation? There are several steps you can take before and during brumation to ensure the process will go safely. Give him some extra food so he can fatten up a bit prior to brumation time, which would be late autumn. Measure your beardie’s weight through the autumn to ensure you keep check of the trends – if he is gaining or losing weight. Test him for parasites. Parasite infestations can remain completely under the radar until your dragon goes through a period of stress. Although brumation is natural, it does pose a significant strain on your pet’s body – which is a perfect moment for parasite proliferation in the case they are present. Do not take the question of parasites during brumation lightly, since it can mean the difference between life and death for some beardies. Most vets should be able to perform standard tests for common beardie endoparasites – pinworms and coccidia. Depending on the number of parasites, a good reptile vet will suggest therapy if needed. 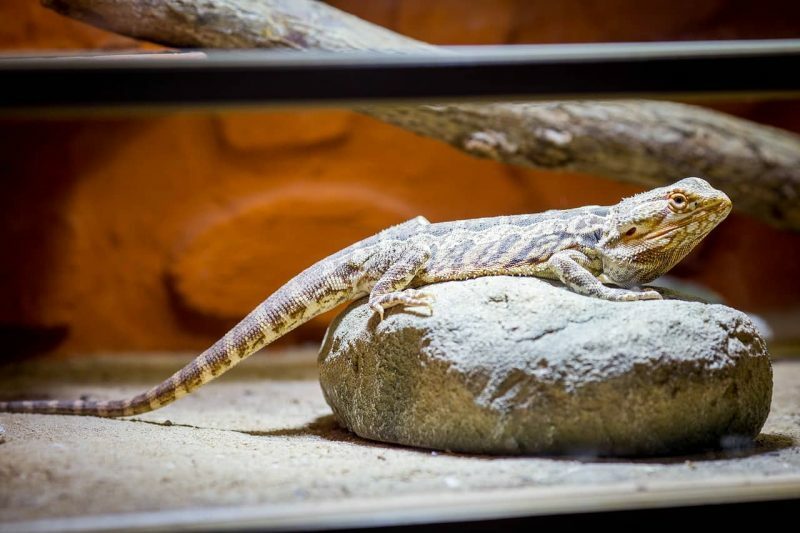 Do not get disturbed if your beardie gets some low parasite counts and your vet doesn’t suggest any therapy – many bearded dragons have a certain amount of coccidia which does not harm them as long as the counts are low. What to Do During the Brumation? The most important thing to do for your beardie during brumation is – let him be. Apart from the basic care, beardie should be left alone as much as possible. When you notice the brumation signs and you’ve ensured that your beardie is healthy, you can help him enter brumation by shortening their day. Reduce the lights gradually each week by 30 minutes until you get from the standard 12-14 hours to 8-10 hours a day. The temperature can go down a bit, but should always remain well in the recommended range. Note that brumation will happen regardless if you shorten your beardie’s day or not. This only a way to make it more natural (plus save some power). If the autumn comes, and your beardie is not showing signs of brumation – do not try to force him into it. Don’t get worried if the brumation lasts for months – eg. November thru March. Many owners get anxious and feel the need to wake their beardie up, but you should definitely not do it. If you’ve determined that your pet is healthy, there is absolutely no need to panic. Possible dehydration is a critical concern related to the beardie brumation. Offer your beardie water once in a while by dropping it on his nose. Do not use the sprayer because spraying during brumation could raise the humidity in the tank excessively, possibly leading to fungal and respiratory infections. Take your beardie – sleeping or awake – for a weekly bath. You need to do this in order to keep them hydrated and clean. Some beardies will sleep through their bath, which is fine. Just make sure to keep their head above the water. Once you are done with bathing, make sure your beardie is completely dry before he returns to his hiding place. You will ensure this by keeping him under the basking lamp for a while. Offer your beardie food, but don’t be pushy about it. Your lizard will feel if he needs to eat and how much. There are no rules – some bearded dragons eat almost regularly when they go back to sleep, and some will refuse food completely. If your beardie has had his meal, increase the temperature in the tank a few degrees to ensure good digestion. Try to get him to bask for a while a couple of days after the meal – although be aware that many dragons will just run back into their cave. Lastly, give him another bath about two days after the meal to stimulate his digestives system. Once he has passed his stool, you can leave him be. Stool that doesn’t get passed can rot in the bowels, resulting in a near-death situation. It is obvious why you should avoid this scenario by all means. Should I Try to Wake my Beardie and End Brumation? Besides the “basic maintenance” that I described above, brumating bearded dragons should not be disturbed until they wake up on their own. Studies suggest that trying to snap a bearded dragon out of brumation will only result in prolonged overall brumation time. How Does the Bearded Dragon Brumation End? Brumation will end the same as it has begun – naturally. Beardies will “feel” the spring coming and start waking up around the beginning of March. They will start basking more often, gradually increase their interest in food. After they are fully awake, male beardies will slip into breeding mode, with darkened beards and bobbing heads. They may be unable to focus on food at this point, but that is perfectly normal – especially if there is a female around. By mid to late spring, beardie’s behavior will stabilize and they will continue being their old selves. By taking good care of your beardie and keeping track of his health – you will ensure that your pet dragon will reach the brumation season ready. If you’ve done your best, there is no need to panic. Just take good basic care of your beardie, as described, and let nature take its course.